Acquired: IP 2015, Adrian Peterson Day, Palestine,Tx. I had tried- and failed to acquire the bell cow of the Riders offense TTM a few years ago. Knowing that Ivory Lee Brown was Adrian Peterson‘s uncle, I hoped to track him down at the Peterson event. I got Adrian early, but Ivory arrived in style- late. There were intermittent downpours in which I’d get soaked, and then dry out long enough to baste, but it was totally worth it. Ivory was really nice and gave me his autograph on this card and photo that I had. He’s the same giant man mountain- maybe a bit more reticent and quiet from his playing days; However, he flashed that clever smile when I asked him about his gaudy yards per carry from his college days at Arkansas Pine Bluff. 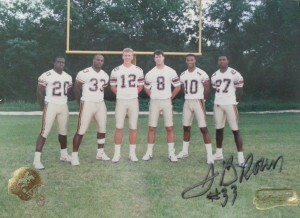 He also very much liked when I brought up how he was the World League’s leading rusher in 1992. The photo he signed was from a set given away in Central Texas’ HEB Super Markets promoting the Riders 1992 season. 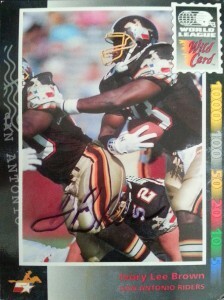 The 1992 Wild Card WLAF card was the only issued card that featured him in a San Antonio Riders uniform. I got it many years after the league disbanded and had him pen the card at the event. From what I understand, he still lives in the Palestine area.